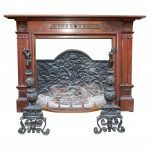 Circa 1890, outstanding carved walnut Art Nouveau two piece bedroom suite with profusely carvings of apples and vines, with two bevelled mirrored doors and a central cupboard over open shelf and bank of drawers, and two deep drawers in the base. 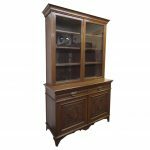 With matching carved dressing table which has unusual outswept gallery to sides with finely turned supports. 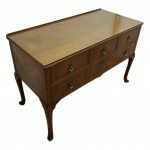 Dressing table size 162cm high (81cm high to surface) x 117cm wide x 57cm deep. Wardrobe size 220cm high x 200cm wide x 69cm deep.